Here are some examples of how digital utility is merging with our day-to-day lives. And it goes a lot further than a flashy new App, or Facebook giveaway. This is how digital can almost seamlessly integrate with tasks we already do, implanting itself in our lifes as if it was always there. This is a great example of how digital can almost seamlessly integrate with our day-to-day lives. In South Korea, Tesco noticed that the population had minimal time and motivation to go shopping - and that they spent a lot of time in the metro. The idea then came to transform the underground platforms into real supermarket isles - but wait, not REAL supermarket isles. The products are laid out just like in a regular supermarket - but with QR codes to order the products. Once ordered (via Smartphone), orders are delivered in just a few hours to the customers home. An invention that not only worked for the business - but ultimately, provided a service for the consumer. 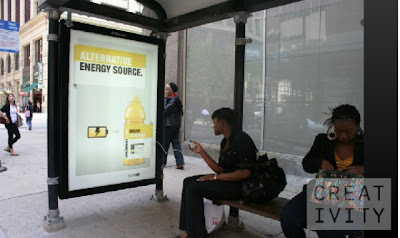 To highlight the "energy boosting" properties of Vitaminwater, the company installed USB ports on bus stops in 4 US cities. While waiting for the bus, passengers could charge their iPod, Smartphone or iPad. So while it might not be the latest technology - it's digital, and certainly providing consumers with added value. Invest in "MyFarm", and you can (almost!) become a real farmer.The concept is based on social games such as Farmville on Facebook, where you can create a virtual farm, grow crops and help fellow farmers. The aim of "MyFarm" is, by "bringing this concept to life", to create a community of 10 000 "farmers", who have each donated £30, who will vote on major decisions every month on the farm. This initiative highlights the growing need from gamers to "give meaning" to the virtual world - it's no longer new and exciting - but needs something "more". Take a look at Flowing Datas "Data Life of the Future" with some mind-boggling but almost believable predictions - of data that "will intertwine with your day-to-day like threads in a fabric". Or watch "A Day Made of Glass" - with over 14 milllion views, this life where "touch" makes everything possible somehow doesn't seem too far away !